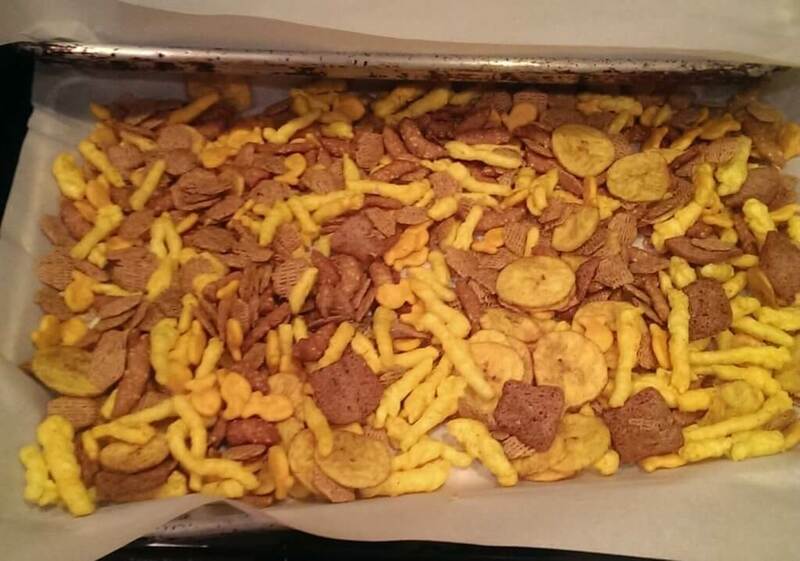 Canna-chex is a great alternative to cloyingly sweet baked cannabis edibles. The body metabolizes THC through the gut differently (and more slowly) versus by inhaling it into the lungs. The liver metabolizes Delta-9 THC into 11-OH-THC, which passes the blood-brain barrier, and enhances the psychoactive effect. 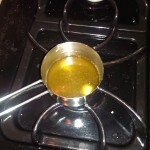 Once you have the butter or oil, use it as you would in any recipe. 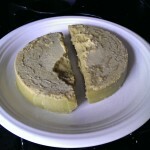 Store butter or oil in the freezer in an airtight container for maximum shelf life. Shake or trim work as well as bud for making butter or oil, as they still contains a lot of THC. 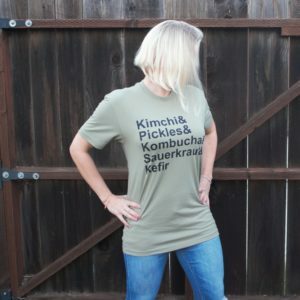 Once you have a batch on hand (I store mine in an airtight mason jar and keep it in the freezer), making snacks is simple. In addition to the potency of the butter/oil, you can also adjust the strength of the finished snacks by adjusting how much butter you use in the recipe. 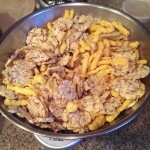 For the mix, pick salty, crunchy snacks that have an ‘absorbent’ texture. 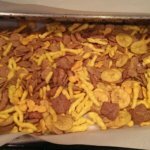 Pretzels, baked rice crackers, and other snacks which have a “shiny” texture do not absorb the butter as well as snacks with an “open” texture. “Open weave” breakfast cereals like shredded wheat or Chex, rye toasts, cheese puffs, plantain- or banana chips, Goldfish crackers, corn nuts and sesame snacks are all examples of absorbent textured snacks. 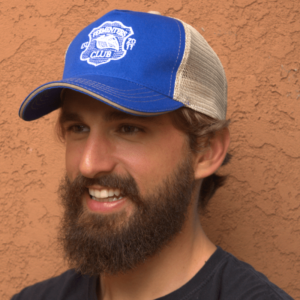 It seems like it’s getting harder and harder to find pre-made snacks that don’t contain dreaded vegetable oils (safflower, canola, sunflower, corn) or GMO ingredients. It is relatively easy to build a gluten-free mix based on rice- or corn-based snacks. THE MOST IMPORTANT part of the preparation is ensuring that you evenly coat the mixture with the butter/oil. This can be tricky due to the varying sizes and shapes of the pieces. The best kitchen way to get everything evenly coated is to use a gloved hand. Keep stirring the ingredients under a stream of butter drizzle. Spreading the butter unevenly will give you inconsistent results and varying levels of strength from bite to bite in the final snack. (Dry ingredients weigh about 16 ounces/450g and yield 8 cups/2 liters); find a balance of lighter and more dense ingredients to blend together. Preheat an oven to 225°F. 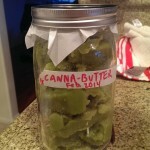 Melt canna-butter or oil over low heat or in the microwave . 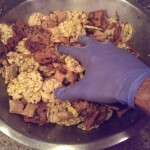 Using a gloved hand, carefully mix and fold dry ingredients together slowly in a large mixing bowl. Peel garlic. Using a microplane, grater or garlic press, grate or press cloves into melted butter. Stir miso paste into melted butter mixture. Slowly drizzle ¼ of the butter mixture into the mixing bowl in a thin stream. It is important that you coat all the ingredients UNIFORMLY. Use one gloved hand to carefully stir and fold the mixture while pouring the butter with the other hand. Mix thoroughly. Repeat the previous step 3 more times, each time incorporating ¼ of the mixture, until you have poured all of it into the large mixing bowl. Spread mixture evenly onto two half-sheet pans lined with parchment paper. Bake for 75 minutes. At 30 minutes, rotate the pans and move them to different racks in the oven. 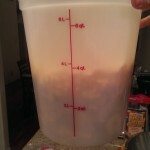 Remove from oven, let cool, then store in airtight container. To keep long-term (more than a few weeks), store in freezer. 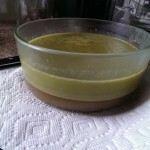 Remove solid from liquid below– butter! Freezes well. Added parchment paper under lid. Use gloves to keep from absorbing the butter! Your Brain On Edible Marijuana, youtube.com/asapscience. Accessed Mar. 13, 2018.